Let us begin by asking you about your educational background and your work experience. JB: I have Bachelor’s degrees in physics and engineering physics from the University of Kansas, but growing up in Colorado nurtured a strong interest in geology. Upon completion of my undergraduate education, I was looking for a way to combine my outdoor interests with my education in physics which led me to geophysics. Rice University offered great exposure to geophysics as practiced in the oil industry while allowing me to pursue my interests in hydrogeophysics – this turned out to be a rather unique combination that has served me well. While at Rice I also worked at the Houston Advanced Research Center and had the opportunity to interact with some of the legends in geophysics, my advisor Manik Talwani, Geno Gazdag, Gerry Gardner and the list goes on. A truly wonderful experience and a place I learned to appreciate the differences between working in industry and working in academia. I also had the opportunity to work on projects focused on oil exploration as well as environmental and engineering problems. I have spent my post-graduate career in academia with a stint as a research scientist at the University of Wyoming, and now 15 years at Boise State University in various positions on the faculty. I have focused on applying geophysics to problems in environment, hydrology, and glaciology, but have always sought to maintain ties to the state of the art in the oil industry. RN: After finishing my undergraduate degrees in Geology (BSc) and Geophysics (BSc Honours) at Victoria University of Wellington, New Zealand, I spent some time travelling around the world before undertaking a PhD at the University of Calgary, Canada. My thesis, under the supervision of Don Lawton and Deborah Spratt, looked at practical ways to populate a four-term velocity model for pre-stack depth imaging with anisotropy and has served me well throughout my career. At the University of Calgary, I was also fortunate to also work closely with Larry Lines and co-wrote SEG Monograph 13 – Fundamentals of Geophysical Interpretation. After graduating I started at Nexen, Calgary, having already worked on temporary or part-time contracts with BHP, Occidental, Exxon and Veritas during my studies. Nexen was an excellent company to work for and I thoroughly enjoyed the exploration challenges that filled my day. We looked at the foothills, shale gas and new ventures, and worked closely with all disciplines. I personally had the opportunity to work both in geophysics and petrophysics over the first few years of my career and am grateful for that opportunity. In 2008, I accepted an expat assignment to the UK to work on North Sea exploration and spent 2 years working in London, England. Following that, I moved to Edinburgh, Scotland, to participate in Cairn Energy’s frontier exploration in West Greenland and, later, take on the role of exploration manager of the Mediterranean and North Africa. Working frontier exploration and new ventures makes me feel alive, so on leaving Cairn to return to Canada, for the great outdoors, skiing and the Calgary geoscience community, I started consulting to small international oil and gas companies predominantly working the Atlantic margins. As I am also passionate about sharing knowledge, I take every opportunity to present, write and teach about geophysics and the industry, through the CSEG, Nautilus and personally in the community. MA: I finished my graduate schools in Saudi Arabia, and all my college education in the US. I obtained a BS degree in Electrical Engineering from the University of Wisconsin-Milwaukee in 1983, and Master and PhD degrees in Geophysics both from Colorado School of Mines in 1987 and 1993, respectively. I have held several technical and managerial positions with Saudi Aramco since 1984, stemming from seismic-data processing and interpretation to multidisciplinary field development and research. For a decade I was the Chief Geophysicist and Chief Technologist for Saudi Aramco’s Geophysical R&D and Chief Geophysicist for Geophysical Technical Services, and became manager of several departments until my appointment in 2009 as Exploration Principal Professional. JH: I’m John Hogg, I’m a Geologist, graduated from McMaster University in 1981 and have spent thirty-five years working exploration projects in the Arctic, Atlantic Canada offshore, and Western Canada. I have worked as a geologist, manager, general manager vice president and now I have a small consulting company, Skybattle Resources Ltd., where I am the President. NM: I hold a BSc in Physics from the Georgia Institute of Technology, an MSc in Petroleum Engineering from the University of Oklahoma, and a PhD in Petroleum Engineering from Stanford University. Before joining Baker Hughes as Senior Executive Advisor, I had a consulting firm (CMG Petroleum Consulting, Ltd.) and worked for two large independent oil companies. I served as Chairman of the Board of the CMG Reservoir Simulation Foundation and as a Director of the Computer Modelling Group, Ltd., Vanyoganeft Oil Company, Pinnacle Technologies, Inc., the Society of Petroleum Engineers and JOA Oil & Gas BV. I am an SPE Distinguished Member of and the recipient of SPE’s Lester C. Uren Award for Distinguished Achievement in Petroleum Engineering, the Degolyer Distinguished Service Medal and the SPE Public Service Award. I serve on the Board of the Georgia Institute of Technology’s Strategic Energy Institute and the petroleum engineering advisory boards of the University of Texas, Penn State University and the University of Houston. I am an appointed member of the Interstate Oil & Gas Compact Commission, widely published author and a licensed professional engineer in four states. How did you decide to offer your services for the position of President of the Society/Association you are serving? JB: I served my first term on the SEG Executive Committee as 2nd Vice President in 2009/2010. I was a somewhat reluctant volunteer at that time, but in the end found it to be one of the most rewarding times in my professional life. It was a place where I felt I could truly accomplish something useful for my fellow geophysicists. When offered the chance to run for President two years ago, I jumped at the opportunity. RN: At the 2013 SEG Annual Meeting, Ron Larson, 2013 CSEG President, enquired about my time in the UK. Seconds after relaying that I was now home living in Canada he said “excellent, have I got a question for you…” I had volunteered in various capacities for the CSEG, CSPG and SEG and, although running for an Executive position wasn’t something that I had considered previously, I looked forward to getting involved with the CSEG again on my return to Canada so the timing worked well. Many colleagues supported my nomination and after being elected to the position I threw myself into the role wholeheartedly. I truly believe that the CSEG is one of the best geotechnical societies in the world and am proud to be able to serve its members in this capacity. MA: I have been an active member of the EAGE since 1988 when I started my PhD at the Colorado School of Mines. After a while, I became more and more involved with the Association. I always enjoyed reading the EAGE flagship journal First Break, in particular the industry news section and the technical articles. The Geophysical Prospecting journal helped to put the icing on the cake with its high-level scientific papers; that got me really fascinated with geophysics. As I moved into the management side of EAGE, I took the initiative to introduce a number of events relevant to the G&G and engineering communities. These included the first-ever workshop on Passive Seismic in Dubai, UAE in 2006 which I also chaired and which has since reoccurred every other year; the first-ever, now biennial, workshop on borehole geophysics whose first two rounds I chaired in 2011 and 2013 in Istanbul and Malta, respectively; and also the first sub-salt imaging workshop that EAGE organized in 2009 in Cairo, Egypt. I continue to work with my fellow Board members and peers to monitor new trends in the industry and academia. There are currently a number of ideas on the table that are undergoing further research and investigation before they transpire in the form of EAGE services. I am delighted to have ramped up my involvement with the Association. After many years of experience in geoscience and also petroleum engineering, I now enjoy chasing new technological trends and attempt to nourish them and adopt them for the improvement of our business, mentoring young geoscientists, and reviewing and assessing scientific papers especially for our EAGE journal of Geophysical Prospecting for which I have been serving as an Associate Editor for over a decade. JH: Volunteerism has always been a part of my professional career. I started to volunteer right out of school with the Canadian Society of Petroleum Geologists, CSPG, then with the AAPG when their annual Conference came to Calgary in 1982. For more than thirty years I have had increasing more responsibility in AAPG as committee chair, General Chairman for the 2005 AAPG ACE in Calgary and as the Vice President of AAPG before running for the office of President in 2014. NM: I joined SPE as a grad student at the University of Oklahoma when a professor taught our first class. He handed out applications and said “if you want to be in the oil business you join SPE.” I attended section meetings and met people who became lifelong friends. I published papers, served on committees, traveled the world as a Distinguished Lecturer and served on the Board. Involvement with SPE has always been part of my professional life so that eventually it seemed like a natural extension and a kind of capstone to a 40 year career. What is your perception about the role of your Society/Association in the geoscientific community? JB: Globally, SEG is the largest and most respected organization for applied geophysics. It brings together the researchers developing the most advanced technology with the companies that are looking to put it into practice. What our members value most about SEG, is its delivery of top notch technical content through our journals, conferences, and workshops. RN: I think of the CSEG as the “little society that could”. With three staff members and an excellent volunteer base we offer members phenomenal variety and value. The CSEG is very much member driven and initiatives such as DoodleTrain, our week long training week; Symposium, a one day single session event honouring a notable CSEG member; the Technical Luncheon, Lunchbox and Microseismic User Group Lunch; Mentorship and Emerging Professionals Programmes; Geophysics Industry Field Trip (GIFT); DoodleSpiel curling tournament; DoodleBug, WiSE and T-Wave golf tournaments; and the Ski Spree wouldn’t be possible without our fabulous volunteer base. The RECORDER, our monthly magazine, regularly publishes outstanding technical papers as well as keeping members up to date on society activities and the CSEG Journal publishes peer-reviewed papers. We are also excellent collaborators and have worked with our fellow societies forming the GeoConvention Partnership with the CSPG and CWLS; promoting the CSEG/EAGE/GAGGS talk series at the University of Calgary; running the CSEG/EAGE Land Seismic Workshop; hosting the SEG Distinguished Instructor Short Courses (DISC); promoting SEG, EAGE and GSH events; and reaching out to other like-minded societies. Lastly, we have an outstanding charitable arm, the CSEG Foundation, that supports students, members and the general public through a variety of initiatives including the CSEG Distinguished Lecture Tour, Earth Science for Society, Seismic in Motion (with CAGC), Challenge Bowl, University, School and Public Outreach, and scholarships. The CSEG leads the way when it comes to showing what can be done with an enthusiastic, focused, savvy volunteer base and I believe that every member should be proud to be associated with our society. MA: I see strengths in almost all the bands, ranging from the workshops to the education programme, our two divisions of Near-Surface Geophysics and Oil & Gas, our six journals, and an assortment of newsletters in English as well as foreign languages (Russian and Spanish at present). If I were to single out our greatest strength, I’d pick our annual conference because, in addition to its excellent organization and quality content, it embraces all the aforementioned spectrum bands and more. JH: The AAPG is the world’s largest professional geoscience association, I’m the 99th President. We provide pure and applied scientific research to the geoscience community and have members in 122 countries around the world. Our role is to educate, teach, network and publish through conferences and exhibitions, Student chapters, Young Professionals groups, education programs and our online programs such as Search and Discovery and our digital archives. NM: Although we are an engineering society, many of our members are geoscientists. With more than 165,000 members worldwide we are far and away the largest of the professional organizations serving the upstream community. We have more than 200,000 technical papers available online. We collaborate with all the other professional societies and see our long-term role as being parallel to the other societies whose focus is primarily on earth sciences. I certainly encourage membership across platforms; I have spoken at SPWLA, SEG and AAPG events and am an AAPG member. How has being a member of one (the Society you are serving), or more professional societies influenced your career? JB: I would say that my membership in SEG has influenced my career in two significant ways. First, through the journals and meetings, I am constantly getting ideas to advance my own research. SEG’s journal Geophysics, and the SEG annual meeting have had a bigger influence on my research portfolio than any other journal or meeting. Second is the global network of friends and colleagues I have developed through involvement with SEG. It has reached a level that was unimaginable when I was starting out. This has created numerous opportunities, both professional and personal, that have been invaluable. RN: Being a member of professional and technical societies has been critical to my career development. Since graduate school, I have been a member of the CSEG, CSPG, CWLS, SEG, AAPG, EAGE, PESGB and APEGA, albeit not all at once or in all cases continuously. My experience has been that almost every contact made has been through university, the company that I was working at or a technical / professional society. Since we make limited contacts at university and within our own companies, the technical societies are a critical resource. Presenting at the SEG Annual Meeting in 2001, led to an opportunity in which Heloise Lynn generously sponsored my attendance at the 10IWSA in Germany. Presenting at and attending Calgary Global Exploration Forum events led to two interesting projects and the opportunity to collaborate with talented individuals. Many of my clients are met during discussions at technical luncheons, conferences or social events. Industry colleagues with whom I have strengthened relationships through the CSEG are mentors, clients, service providers, excellent technical resources, and friends. Some of the best advice given to me by my university supervisors was to join and actively participate in the local and international technical and professional societies. As a new graduate I didn’t truly believe in the ‘hidden job market’, but now I am acutely aware that without the contacts provided by a strong network, often built within the various societies, many great opportunities will be out of reach. So, whether you are a new graduate, un- or under-employed, actively working or retired and looking to give back to those following behind, the technical societies are our hub. Stay involved. MA: Big time, for being affiliated with professional societies is like flavoring a gourmet with appropriate spices. Workshops, educational faucets, field trips, conferences offered by such societies always focus on current and futuristic trends that our industry professionals need to be aware of. In short, those societies help keep one’s eyes focused on the ball all the time with their assortments of offerings that may not be found in academic text books. JH: Both scientific and professional societies and associations have help me further my career. In Canada, geoscientists need to be licensed, it’s the law, so my provincial association, the Association of Professional Engineers and Geoscientists of Alberta, APEGA and the CSPG have been the two groups that I have used to establish a professional and scientific network, give professional talks at conferences, publish on my geoscience work and they were used as part of my credentials when I have given formal testimony in front of the NEB and other semi-judicial l bodies. So, the scientific and professional association have been both beneficial and important for my career. NM: The most obvious role was when I was an independent consultant. Many of the opportunities I obtained to consult were direct results of contacts and friends I had developed as an SPE member. I staffed projects with my contacts from SPE and leaned heavily on SPE technical resources for research support. What role did a mentor (if any) play a role in your professional life? Is this something you encourage others to follow? JB: I have always been an independent person, and don’t think I ever had the classic mentor/mentee relationship. However, it would be impossible to say that I have not been influenced and guided by those more experienced than I. From my graduate advisor, Manik Talwani, and first supervisor at BSU, Jack Pelton, I took to heart a message of guarding against being overly critical of others professionally. Being kind in providing constructive criticism, open to new ideas or ways of thinking, and respecting the value that others can contribute not only is the right way to act, but ultimately brings greater productivity and advances the science and profession. 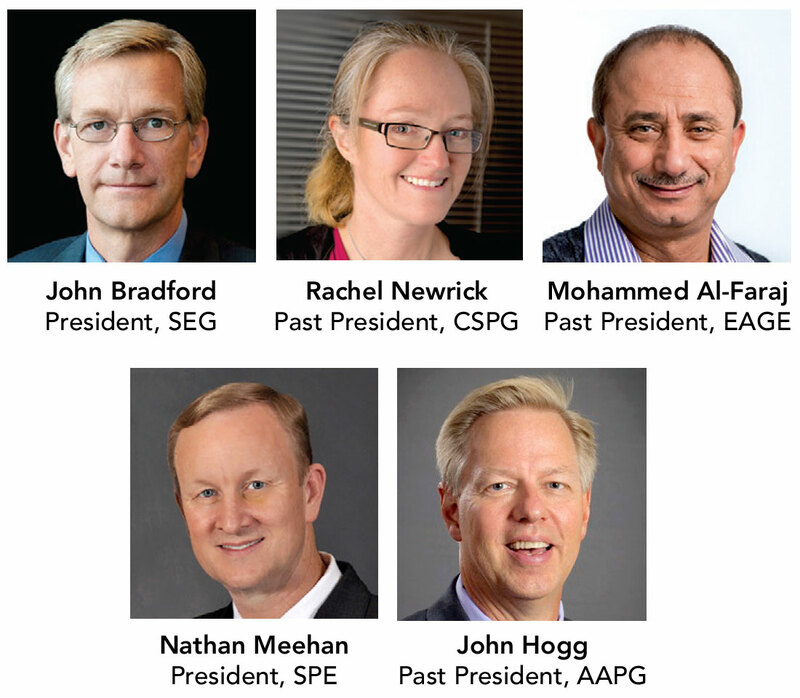 From Peter Pangman, SEG Associate Executive Director during my first term on the SEG Executive Committee, I learned a great deal about maintaining composure and respect, even during heated board discussions, and this has served me well beyond my SEG activities. These are qualities I seek to emulate and to encourage in my students. RN: When I was in primary school, an influential teacher, arguably one of my first mentors, taught us that “you don’t have to put out someone’s flame to shine brightly”, and I would add to that and say, “by lighting the flames around us we shine more brightly than we could alone”. By helping each other and recognizing talent, we build value within our companies, the industry and our lives. Since then, there have been many mentors in my life with varying degrees of impact – some for a specific instance, others over the long term. Some of them would hesitate to say that they were mentors, but they were. They all played a critical role in helping guide my career, and my life, whether be it a chance meeting and some salient words, or an ongoing professional relationship in which they have provided guidance on a regular basis. Everyone has mentors whether we recognize them as such or not. Often when I say thank-you for the impact that they have made, I get a look of surprise, as they were simply genuinely helping out and offering guidance without any expectation. So to all mentors, thank you. As well as mentors, both advocates and sponsors are critical to career development and advancement. An advocate will be a champion and talk in a proactive and positive way about you, and a sponsor will be able to influence career advancement. For women especially, finding sponsors can be difficult so it is important to be educated on the differences between mentors, advocates and sponsors and to understand how they affect your career path. If you are someone in a position to mentor, advocate and sponsor, please consider helping those following in your footsteps. It can be as simple as a coffee meeting offering some guiding comments, or as impactful as directly recommending that someone be moved upwards into a position that will stretch their abilities. MA: Unfortunately, I personally was not lucky enough to receive all the ‘structured’ mentoring I always had wanted to get when I was young. This, of course, is not reflective of all baby boomers to whom I belong, obviously. So, in my case I had to rely for the most part on internal training courses offered at work, complemented with self-development strides linked to the G&G and engineering arenas, and I succeeded in doing so relatively easily because of the higher education I had on hands. This said, however, mentoring, especially when engineered correctly, is extremely important for it grooms the future professionals in a shortest and most rewarding path. JH: Personally, I think the best mentors are the people who come into your career through happenstance. They may be industry leaders, colleagues, supervisors, managers, vice presidents or presidents. They are people who you may admire for technical, interpersonal, inspirational, or for me, people who knew how to explore. They influence your life, they can change your career and they generally make you a better person. I’ve also been involved in formal mentoring programs and they are somewhat hit and miss, on both sides; you can’t make someone enjoy working with someone by an online survey of likes and dislikes, so more often than not, they don’t really work well. My advice to anyone reading this, when you appreciate someone’s skills, in any area, reach out to them when you need a hand, or an ear, even if those moments are short, make them count. NM: I was lucky to have a former SPE President (my current role) serve as my mentor. M. Scott Kraemer served as SPE President 44 years before I did, but more than 30 years ago he taught me many examples as I served as the Region Engineer. He brought me in to discussions and presentations about many things outside my area of expertise and he expected me to learn quickly. Once we had an opportunity to take advantage of another company’s honest mistake and some encouraged him to do so. He put me in charge of the decision and said that I should do the right thing. He was very pleased when I allowed the company to correct its mistake and I learned a valuable lesson. I have tried to mentor many young engineers and am thrilled to see so many of them succeed. The oil and gas industry is cyclic in that it goes through ups and downs (in the price of the barrel) created due to geopolitical situations, or otherwise. This impacts the oil and gas companies, as is happening at present, what with employee layoffs, mergers and acquisitions, reduced capital expenditures by companies, etc. What role do professional societies/associations play in such ‘difficult’ times? Also, how do these societies/associations themselves tide over these ‘difficult’ times? JB: This of course is the key question of the day. First I’ll address the effect on SEG. The impact on the professional societies lags behind the impact on industry more generally by about year. We see this on the downturn and expect the same on the upside, so when the industry starts to turn around we can expect about another year of difficulty for the society. Right now, SEG and the other organizations are being hit hard. SEG has recently undergone the first major contraction in institutional memory, but we believe we are now positioned to ride out an extended downturn. This of course has not been easy on our staff nor on our programs, but we have tried to keep an eye on the upside – Improving efficiency in all of our operations and becoming focused on what is truly of most value to our members. We also have in place a number of benefits for our members who have recently lost their jobs to include a dues waiver program, along with discounts on meetings and continuing education. It is critical for unemployed professionals to maintain their contacts and training while they seek employment and we are committed to providing cost effective access to the programs that offer the most value to our members. RN: Professional and technical societies play an important role during difficult times as we provide a hub for members to network, to keep up professional development training, to attend luncheons and conferences, and to generally stay in touch with the industry especially if they no longer have industry contact through their workplace. During this current downturn, the CSGE has provided additional soft skills workshops and presentations through a number of avenues including the Emerging Professionals Program (EPP) and GeoConvention. These have been well received by the membership and I have taken a few phone calls from members thanking the CSEG for the additional offerings. The CSEG, like many members and companies, has been adversely affected by the downturn. Our memberships, sponsorships and activities have all seen a decline in numbers resulting in a significant deficit budget for 2015 and 2016. Many years ago, the Executive put in place the means for building a substantial war chest so that the society could weather the storm for a few years at a time. For example, the 2015 deficit budget offset the profit made in 2014, and only now in 2016 are we starting to use the funds put aside for a time such as this. The Executive is cognoscente that a deficit budget cannot be run for more than a few years and are closely watching expenses as well as the bottom line. We are polling members to identify key services and looking at those areas in which we can make the most significant savings without compromising the heart of the CSEG. We run fairly lean given the volunteerism of our members. Many of our technical and social events are either open to associate societies or run jointly to maximize the benefits to the extended geoscience community. Just as tough times necessitate technical innovation, they also necessitate financial innovation and efficiency. For example, moving our technical luncheon to the Calgary Petroleum Club was first investigated for financial reasons but resulted in a multitude of benefits including being a more convenient central location with access through the +15, healthier lunch and considerably more ambiance. The CSEG Executive and committee members continue to work towards additional efficiencies. MA: History tells us that drops and rises in oil prices are periodic. It is, therefore, commonsense to assume that the current low prices will bounce back at some point. This price-rebound ‘assumption’ can be further substantiated if one factors in the facts that petroleum assets are finite commodities and that the human need of such assets is foreseen for at least a few decades to come. Consequently, the industry will sooner or later resume absorbing professionals to keep the business going. All geoscientists and engineers, especially those who have temporarily lost their jobs, should seek further education, either formally from colleges or intermittently from professional societies such as EAGE. JH: In times like these I feel that our associations are an anchor point. There are many people laid-off around the word, nowhere are industry professionals’ immune to low oil prices. The associations are a place to upgrade your training, meet at association functions with colleagues about possible roles, do some volunteer work to continue to build skillsets, and network, network, network. NM: SPE is here in good times and bad. Our mission has two components. One is to collect and disseminate technical information and the other is to advance career opportunities. Our programming reflects the times and includes students, young professionals and all the others up through our most senior professionals. This takes on many forms from workshops on how to be a consultant or improve a LinkedIn page to resume writing and practice interview sessions. Our meetings are networking opportunities and most importantly the technical resources allow job seekers the ability to stay current in technology. ...continue to Interview with Presidents of Professional Societies – Part 2.